Among 2016's many losses was Zaha Hadid, an architect and designer who left her mark on cities around the globe. In New York City, her Highline-adjacent condos are now on the rise, and will feature a curvilinear facade that brings a touch of sci-fi to Chelsea. The pioneering Hadid once told Newsweek, "I don't think that architecture is only about shelter, is only about a very simple enclosure. It should be able to excite you, to calm you, to make you think." In the spirit of that sentiment, we're taking a close look at 2016's most exciting, thought-provoking new developments—as well as what we're looking forward to seeing pop up on the skyline soon. Some developers opt to create new developments that blend in with their surroundings, in an attempt at seamlessness with NYC's architectural history. 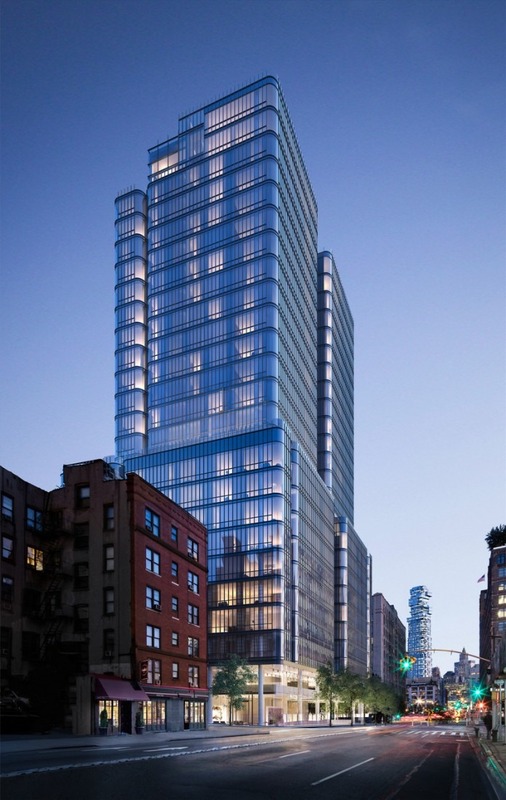 Herzog & de Meuron, the Swiss architecture firm behind the 56 Leonard Street condominium, seem to have gone as far as possible in the opposite direction. 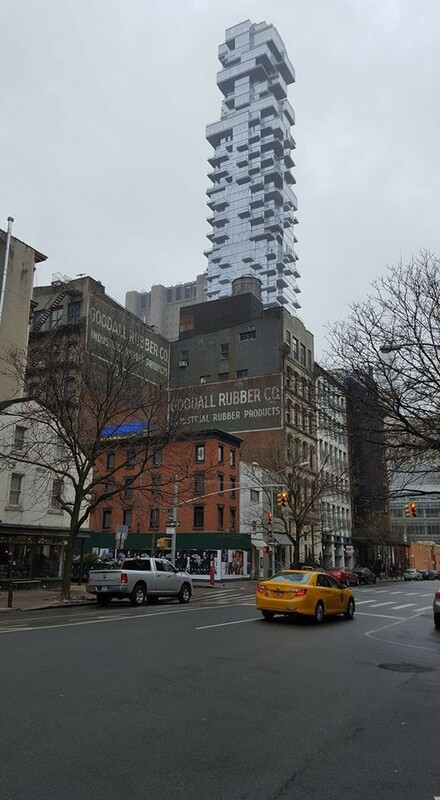 The 60-story tower in Tribeca has been dubbed "the Jenga building" for the way it rejects smooth, uniform surfaces with its unevenly stacked units. Edwin Heathcote, architect and design critic for the Financial Times, gave the cantilevered tower a rapturous review, citing it as the exemplar of architecture that is at once "commercial and provocative." It recalls the deconstructivism movement of the 1980s, he writes, in which new construction acknowledged the contrasts—and even incoherence—of urban living. At 56 Leonard, Heathcote says, the "staggering of the units—which appear almost as stacked containers—create a sense of individuality, each pointing in a particular direction. They are separate and distinct, more like houses than flats, and give the building a striking appearance with the roof of each apartment becoming a terrace for the one above." 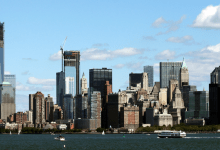 Almost all the units sold shortly after hitting the market in spring of 2016, reports Curbed, although according to a StreetEasy search, you can still snag a six-bedroom penthouse for $17.75 million. There's an argument to be made that 56 Leonard does more than just offer lavish apartments for the super-wealthy. When the plans for the structure were first announced, Justin Davidson at New York magazine praised the property's "anti-cookie cutter aesthetic"; its appearance makes it a work of sculpture as well as a residence. Plus, 56 Leonard comes with a bit of public art: At the base of the tower will be a new piece from Anish Kapoor, the artist behind Chicago's famous "Cloud Gate." At the opposite end of the spectrum is this 12-story condo on the DUMBO waterfront, with a facade that skews more toward uniformity. But while the exterior initially appears unobtrusive, the property, designed by Alloy Development and Monadnock Construction, is, in fact, quite artful. 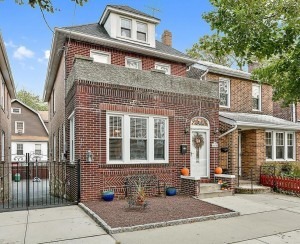 Jessica Wetters, an architect with Bolster (FYI, a Brick sponsor) who has 16 years of experience designing NYC homes, points out that there's more to One John Street than first meets the eye. "I think this is the most sophisticated and beautiful residential building built in 2016," Wetters says. "The facades are very simple, pure, uninterrupted modern grids that gradiate up the building, like an Agnes Martin canvas." The building's windows, which get slightly smaller in size as you move upward, serve as a canvas, reflecting the river and changing in appearance over the course of the day, as the sun rises and sets. Interestingly, the property also helps to boost city greenspace: According to Crain's, residents make monthly payments to Brooklyn Bridge Park Corp, which manages nearby Brooklyn Bridge Park; the developers have also paid the organization for a 99-year ground lease and regularly sponsor community events in the park. This development of micro-apartments, the winner of a competition led by the city Department of Housing Preservation & Development to find living solutions for small households, welcomed its first tenants in the spring of 2016. 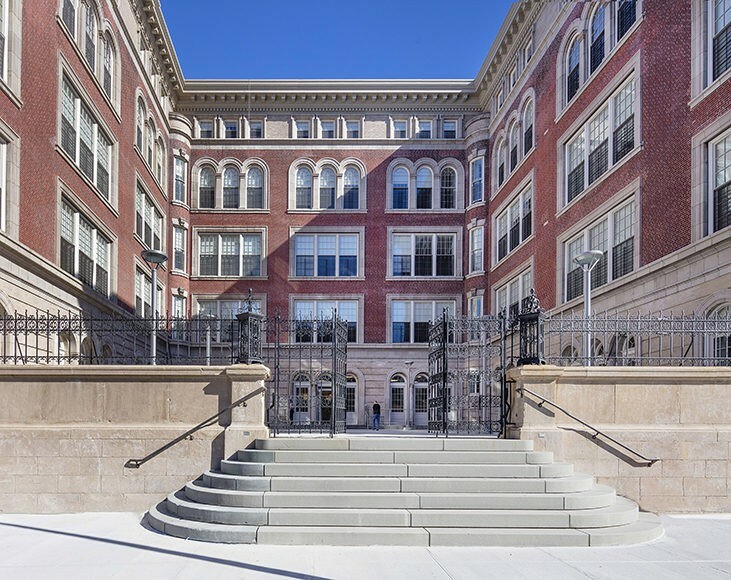 The New York branch of the American Institute for Architects honored the 10-story Kips Bay building as one of its 2016 Design Awards winners. The building was created by stacking 65 pre-fabricated modules made in Brooklyn's Navy Yard on site; 40 percent of the resulting apartments, which range in size from 250 to 370 square feet, are affordable to low and middle-income New Yorkers. 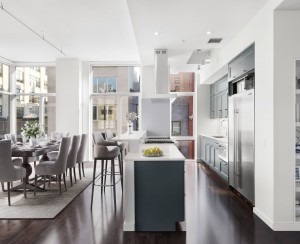 AIANY publication Oculus praised Carmel Place's "efficiency and flexibility," noting how the inclusion of high ceilings, Juliet balconies, and shared amenities create a sense of both space and community for residents. In the New York Times, Penelope Green characterized the development as "humane and lovely," an eminently comfortable place for singles on a budget. 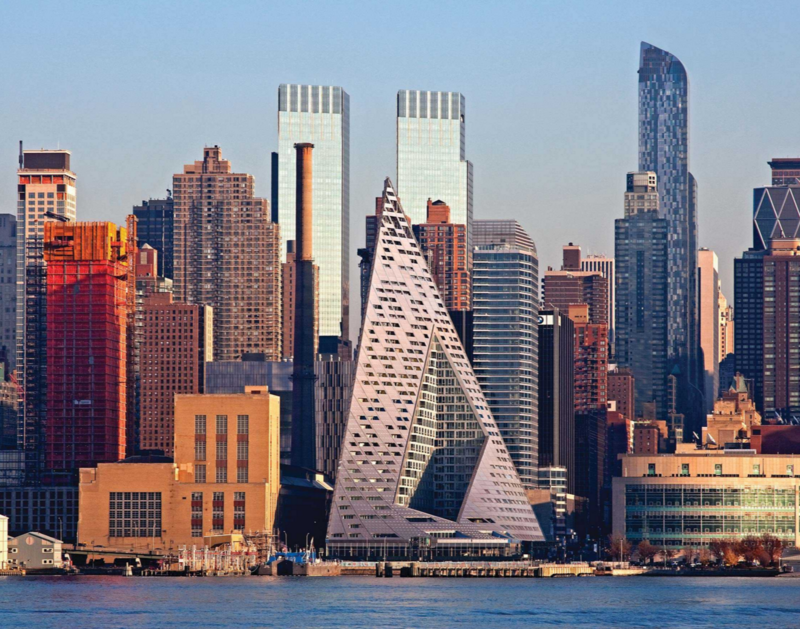 The "pyramid on the Hudson" made the New York Times' best architecture of 2016 list; as writer Michael Kimmelman explains, "No building redrew the city’s western skyline more ingeniously..." The 709-unit luxury rental complex, which includes 142 affordable apartments, is a gleaming, angular triangle with a slice cut from the center to allow for a green interior courtyard. 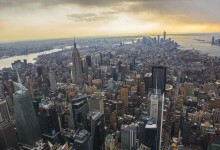 The team behind Via 57 West "have given the city a new spectacle," Kimmelman writes. They've also given us an environmentally-minded addition: Business Insider reports that the property recycles 60,000 gallons of water per day, and responsibly forested wood was used in its construction. Plus, the courtyard, ArchDaily notes, which was based on a Danish model of an "urban oasis," incorporates multiple native plant species. The city's new pyramid serves as a model of not only groundbreaking architecture, but also of sustainability. That is, until Dattner Architects helmed a $49 million renovation to convert the five-story property to a mixed-use development, which includes 78 affordable rentals and 10,000 square feet of space for a Boys & Girls Club facility, writes the Wall Street Journal. The school's exteriors, as well as some interior detailing, including wood trim, ornamental staircases, and high ceilings, have been restored. And in addition to transforming a neighborhood eyesore into an architectural highlight, PS 186 is also already playing host to an expanded Boys & Girls Club membership, reports DNAInfo. It's a heartening example of how new development can enrich a community, rather than stand at odds with it. Renzo Piano, whom Wetters calls "an architect's architect," will unveil his first residential project in New York, a 30-story condo in SoHo. The building's curved edges and glass-clad exterior reflect light in such a way that allows passersby to have a "visual relationship with the building," Piano explains in a video. 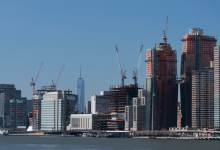 Wetters concurs: "Even though its another mid-rise NYC tower, I guarantee it will be something special," she says. 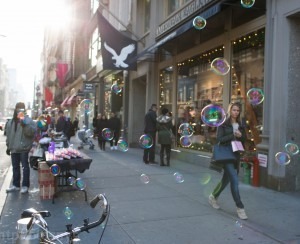 Though at first blush the tower doesn't exactly blend into the landscape, it does nod to SoHo's architectural history. As with the neighborhood's iconic cast iron buildings, there is a focus on minimal, specific materials here, namely "low iron," wide glass that reflects its surroundings with clarity, separated by cast iron mullions. Wallpaper anticipates that the 115 residence property will become "an iconic addition" to the city. 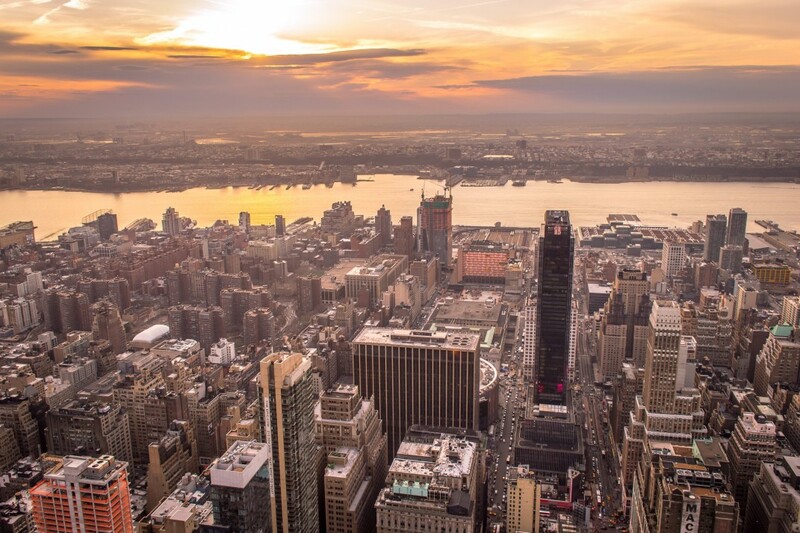 Three big names in the architectural world—Rafael Viñoly, Richard Meier, and KPF Associates—are collaborating on this development of three luxury towers on the Upper West Side. Waterline Square, Dezeen reports, will span five acres along Riverside Boulevard, becoming something of a neighborhood unto itself. 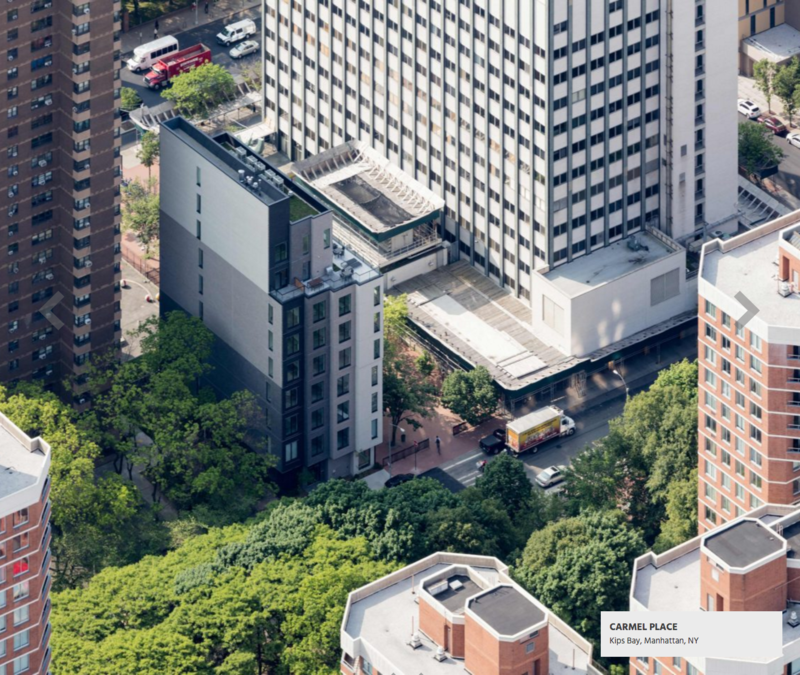 "The three residential towers are meant to create a cohesive residential experience, with particular attention paid to what happens outdoors," Wetters explains. Each building is distinct, but all are sheathed in glass and are topped by angular roofs, with tiers that allow for spacious, landscaped decks. The development will be home to a mix of rentals and condos, with park space between the buildings, featuring abundant greenery, walking paths, fountains, and seating. 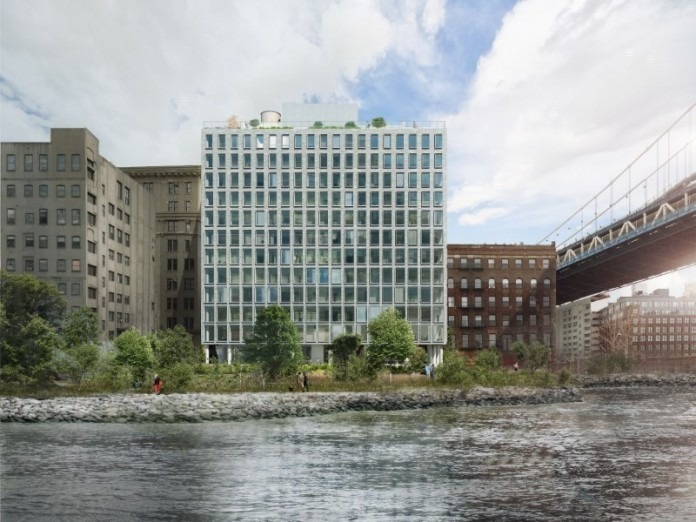 While Waterline's website promises a holistic lifestyle for residents, it won't be removed from its surroundings: its green spaces will be open to the public, providing a lush, walkable link to the Hudson River.